…which inevitably wind up in the trash, never to see the light of day. Regardless of why you want to send out a release – whether you’ve just published a book, your company is expanding (or would like to expand), you have a new product about to launch on Kickstarter, or maybe your organization is hosting a benefit gala – press releases are still a fantastic way to capture the public’s attention. 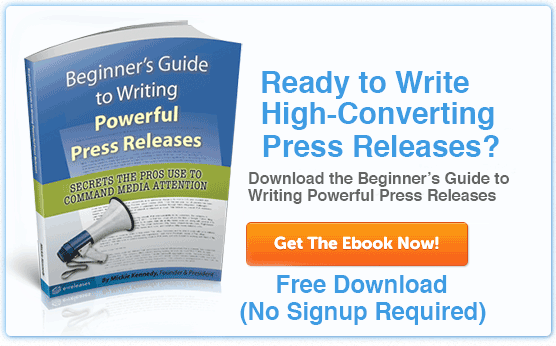 Once you are finished with this guide, you will know that the keys to creating great, attention-grabbing, “Panda Friendly” press releases boils down to generating genuine, newsworthy content. There are no “boring” business profiles, no “dull” niches, and certainly no lack of newsworthy happenings within your company. If you look closely at what’s happening in your industry, and if you truly have your finger on the pulse of your business, you’re sure to find that there’s most certainly news worth sharing. And it isn’t as hard as you might think. The fact that you’ve sought some advice for your release already sets you apart and well ahead of those who will inevitably just “wing it”. So give yourself a hardy pat on the back. Great job! Let’s start with the basics – the press release format. Sometimes dressing well is half the battle. Here’s how to make your release look good for its big day. What should be included in your press release? What should it look like? You can also download our Press Release Format worksheet here. NASHVILLE, TN, Nov 10, 2014 (PR Newswire) — The Davidson County Humane Society announced that they will be holding its second annual Spay-ghetti and No-Balls Dinner on Saturday, December 20 at the Hilton Hotel on 123 Main Street in Nashville from 5:00 PM to 9 PM. All proceeds will go to support the Davidson County Humane Society, which is a no-kill shelter supporting Middle Tennessee. The menu includes spaghetti, vegetarian “no-balls”, and gluten free options. Salad and dessert will be served and there will be a cash bar. The evening will include a pet fashion show featuring dogs who have recently been adopted and a variety of vendors will be selling crafts to raise money for the cause. It will be the perfect stop to pick up last minute holiday gifts. Executive Director Rex Labradoodle said, “Last year, we raised over $12,000 and the support we get from the community touches us beyond words. We have a few surprises in store for our guests this year and we are appreciative to have a community that is passionate about putting homeless cats and dogs in loving homes. “Tickets for the Spay-ghetti and No-Balls Dinner are ten dollars and may be purchased on the humane society’s website or at the door. To find out more how the shelter, how to volunteer, and adoptable pets, please visit the Davidson County Humane society at dchumane.org. The Davidson County Humane Society was founded in 1995, thanks to a generous donation by the late Jack Russell Bullmastiff. The organization is a 501(c) non-profit serving Davidson County, Nashville, and the entire Middle Tennessee region. The organization in a non-kill shelter that accepts strays, neglected/abused animals, and owner surrendered dogs and cats. To date, the shelter has rescued and placed 23, 500 animals and thanks to the support of the community, that number continues to grow. British author Andrew Grant said, “You never get a second chance to make a first impression.” Oh, is this true of the press release – it’s the single most important element! Your headline is the first impression a journalist will get of your story. Is it dull and flat? Is it loaded with sensationalist jargon? The headline should grab the reader”s attention while remaining truthful and relevant to your story. Make it stellar! ALL CAPS IS HARD TO READ, AND JUST COMES ACROSS AS OBNOXIOUS. Stick to title case as in the example to the left. Also consider including an optional subhead, which should be written in sentence format just underneath your headline. This isn’t required, but it can enhance the value of a great headline, and create even more interest in the rest of the release. Remember: the goal is to elaborate on the headline without overshadowing the opening paragraph. The organization will look to raise over $12,000 for homeless cats and dogs. Go through your favorite paper. What caught your eye? Why? 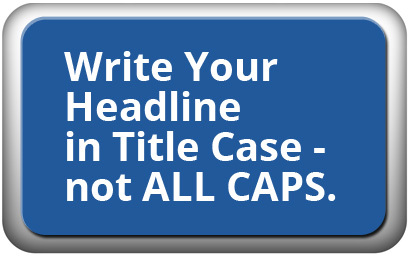 How does your own headline measure up? . 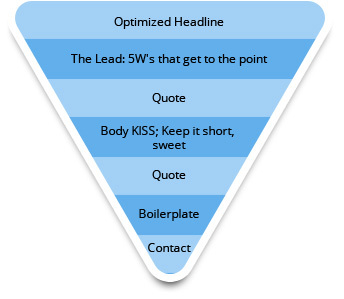 For more ways to jazz up your boring headlines, jump to Chapter 2: Advanced Headline Primer. 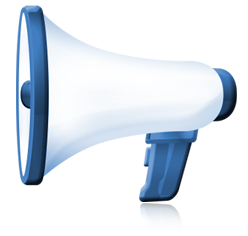 The dateline is the first line in the body of your press release. Standard form in all press releases, just follow the below formula and you”ll be fine. The city and state should be that pertaining to the company/organization for which the release is being written; the date should reflect the date on which the release is being sent to the press. The opening sentence, or lead sentence, is another important element where you should succinctly summarize what is being announced. The opening paragraph should clearly get the reader’s attention through a strong hook while providing the most important facts. As a best practice, write your press release first then come back and develop the opening paragraph as a summary of the press release. Then compare this new opening paragraph with your initial first paragraph. There is an art to crafting the body as well, which makes for the bulk of your release. First rule of thumb: to be a big fish and get noticed, you have to have strong hook for your lead sentence. Jump to Chapter 3 to learn more about how to make your lead turn heads. The body should be three to six paragraphs in length. 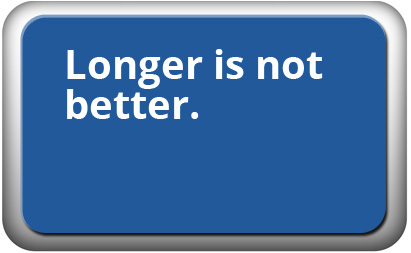 Longer is not better – journalists read hundreds of releases per day, so don’t make conveying your story harder by giving them extra pages to read. Fill your body with content that relates directly to your opening sentence/headline. If it does not relate, leave it out. So what should you include and when? Background information. Who? What? Where? When? Why? This is often referred to as 5W Content. Who? Who is this about, and who does it affect? What? What is happening, and what does it mean? Where? Where is this taking place? When? When did/is/will this take place? Why? Why is this happening, and why do we care? A quote from you or a company exec does more than add significance to your release; if you and/or your company is quoted in a news story (or asked in for an interview), it positions you as an authority, and makes future news coverage even more likely. Again, relevance is key here. There is an entire chapter dedicated to quotes alone, check it out! Chapter 4 – learn everything you ever wanted to know and more about quotes in press releases. The boilerplate goes at the very end of your release, right before your contact information. It is a short paragraph that explains the identity of your company/organization and what it does. Boilerplates are optional, but it doesn’t hurt to have one. Think of boilerplates as a thumbnail sketch of your company that provides a little background information to the press. Once you’ve written a boilerplate, you can use it in all of your press releases. Should someone reviewing your press release have question or need to get in touch with you, make it easy: include your contact information. This is something that should be included in every single release that ever leaves your desk. At the very least, include the name and title of individual that the media can reach out to with questions. Include a number to a person who knows about the content of the release, and not a general phone number. Same goes with email. Direct the media to a specific individual, not just the general inquiry inbox. Finished? End your press release with three pound signs. Final tips: Familiarize yourself with AP Style writing. The AP Stylebook is a journalist’s Bible. If you aren’t familiar, this is the go-to book for the journalistic style used by the United States news industry. No, you do not have to memorize the book, but it might be helpful to grab a copy. This is the preferred style for just about every editor and journalist in the biz, but the stringency with which this is upheld has been vastly loosened thanks to texting and social media. How to Send a Press Release – Don’t tarnish your good name spamming editors!